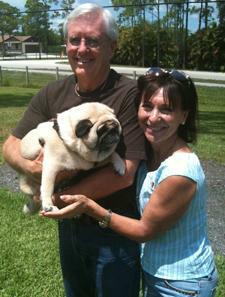 We were fortunate enough to find the perfect little gal from Compassionate Pug Rescue. In the short time we have Emma she has warmed our hearts and has become a part of our Family. We cannot imagine how it was without her. Now her sister, Abby has another view of the situation. Abby has been an only child (pug) for five years now and she is jealous of the attention given to Emma. We had hoped Emma would be a playmate for Abby, but Abby is Abby. Perhaps they will bond as time goes by and Abby can see what Mommy and Daddy sees in Emma. Emma’s tail wags constantly despite all her disabilities. Being blind does not hinder or take away from her disposition. Clap your hands and call her name and she will be there in a flash. The girls love to get new dresses as you can see. I might mention that most of their wardrobe purchases, benefit the Humane Society with the proceeds being used for good cause. We would like to think that Emma likes her new Family. We certainly love her and we are so happy we chose Compassionate Pug Rescue to find our perfect little gal.